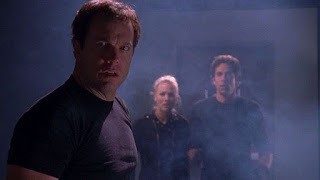 Chuck: "Chuck vs. the Tic Tac"
Despite all of the hub-bub around the shipper drama, season 3 of Chuck is quickly becoming the best of the series because it has definitely upped the action, spy stuff, and character development. Season 3 has also given us one of the best Casey centric episodes to date. The last few weeks of Chuck have been on point mostly because the shipper nonsense has been toned down, and Chuck's progression towards becoming a real spy has pushed forward. This week, Team Bartowski go on a mission to test the security of a facility, and Casey steals a top secret pill for the Ring. We find out Casey's motivations are tied to his life prior to becoming black ops and the Ring is threatening his former love unless he helps. Sarah and Chuck are determined to help their teammate, and the fun begins. Not only do we get some good Casey backstory during "Tic Tac", but there was a ton of pretty good fight scenes. Chuck even takes the special pill to take away his fear, and we get to the the full Intersect in action. Of course Sarah is scared for Chuck while he is in Beast mode, but her look calms the monster. I know some Chuck fans are not happy with season 3 because it's become a lot darker, and the slapstickiness has been toned down, but I couldn't be happier. I'm loving the character development, the increased danger, and the super spy goodness. Sure, I could use a little more lighter moments, but season 3 is far from a bust despite what the Chuck "faithful" are claiming. For the first time all season, I was really interested in this week's Flash Sideways story involving Sawyer because it was something totally different compared to the others (with the exception of Ben's alternate reality). 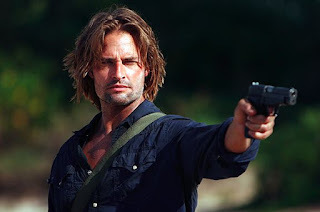 In Sawyer's parallel life, he's a cop and Miles is his partner. I didn't see that one coming, but I really love the idea of James as a conflicted policeman with a hidden agenda. I know Lost doesn't need a spin-off, but this storyline would be the perfect option in my opinion. Back on the Island, Sawyer is still following Flocke/Smocke or whatever the Losties are calling him today. He's sent to Hydra Island to do some recon work on survivors of Ajira Air, just to find out that everyone on that island is working for Widmore. Of course, Sawyer plays double (or triple?) agent well, and he helps set up the showdown between Widmore and Smokey. Pretty interesting stuff. Greek: "Camp Buy Me Love"
OK, I like Greek but things are starting to get a little bit stale for my tastes. 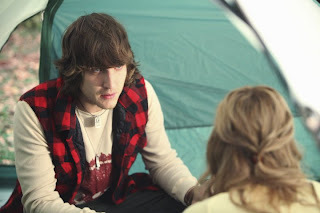 Casey and Cappie are still trying to figure out if they have a future together, Rusty still has to decide between Dana and Katherine (the most annoying plot point ever), and Evan is still trying to cope with Rebecca's betrayal. I understand these types of problems cannot be resolved quickly, but things are starting to drag. So, apparently this week's Scrubs was the series third series finale to date, and more than likely this one will stick. Oddly enough this week's episode was an OK finale by being a starting point for so many storylines. Denise and Drew have come to terms with their relationship and are looking to move forward. Cole's interest in becoming a surgeon is sparked, much to the dismay of Turk, but in the end Chocolate Bear agrees to take Cole Train under his wing. The only storyline that was left hanging was Lucy's, which is shame since she was the defacto J.D. this year. She still learns some important lessons, but not much else was going on. More than likely Scrubs is finally going to be dead and gone after season 9, which is a shame because this season shouldn't have been its last...season 8 should have been. That's not saying I didn't enjoy this new incarnation; it just should have been a true spin-off rather than this mish-mash. I'd gladly welcome a second season of Scrubs Med, but not a 10th season of Scrubs. Does that make any sense? Another short TV watching week. Can't wait until April.